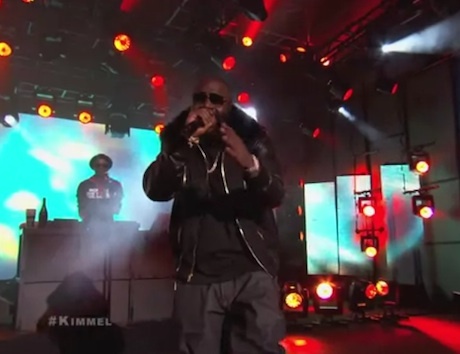 Following the recent release of his Hood Billionaire LP, rapper Rick Ross stopped by Jimmy Kimmel Live! for a performance. On the show's outside stage, Rick Ross performed an explosive, energetic rendition of the album's "If They Knew." While guest vocalist K. Michelle wasn't there to deliver her lines in real life, Ross kept the crowd going with the aid of his DJ and hype man. Watch Rick Ross perform on Kimmel below.